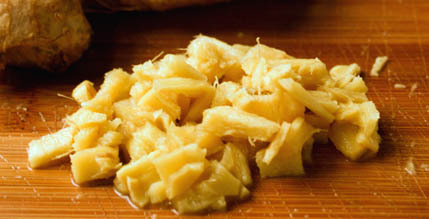 Ginger is one of the most ancient spices in the worldwide cuisine. Due to its pungent and spicy flavor, it is used in Asian stir fries and many fruit and vegetable dishes. Apart from its use in different varieties of cuisine, extensive research has been done to find out the health benefits of this powerful herb. The healing benefits of ginger are mainly due to its volatile oils and oleoresin content. The botanical name of this herb is Zingiber officinale and the common name is ginger root. 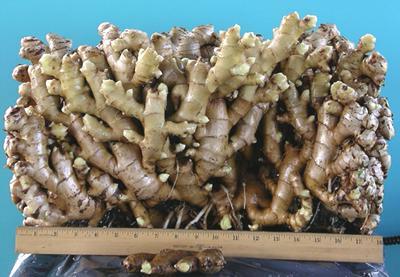 It is the underground rhizome of the ginger plant with a firm, straited texture. The root features knotty finger like projections that grow underground. The flesh of the rhizome can be yellow, white or red in color, depending upon the variety. The skin of the rhizome is brown in color and may be thick or thin depending upon the maturity of the root during harvesting. The pungent smell of this rhizome is due to the presence of essential oils and phenolic compounds. It is used in sweets and alcoholic beverages such as ginger beer and wine. In Asian culture, it is directly consumed by chopping it and adding to the traditional dishes and in beverages such as tea and coffee. During ancient times, ginger was used in making perfumes due to its spicy, strong aroma. This powerful herb has been used in traditional Indian and Chinese medicine for curing several types of ailments. It is a rich source of powerful minerals such as potassium, manganese, magnesium and copper. Pain and inflammation: Due to its anti-inflammatory properties, it is used in treating wide number of pain related conditions such as joint pain (gout and arthritis…see our gout remedies article) and also headaches. It works by blocking prostaglandins, the chemicals that cause inflammation. Colds and flu: Gingerols are the natural cough suppressants and can help in blocking the production of substances that cause bronchial congestion and stuffiness. Nausea and vomiting: Studies have shown that gingerol helps in blocking the body’s reflex to vomit and averts nausea by decreasing oxidative products made in the digestive tract. It does so by blocking the serotonin receptors which are responsible for causing nausea. Hence, it can be used in preventing motion sickness. During ancient times in China, gingerol powder was given to treat diarrhea. Digestion: It helps in facilitating the process of digestion. It helps to regulate elevated sugar levels after a meal, which may slow down the process of digestion. By regulating high sugar, it helps in maintaining regular rhythm of digestion process. Ginger has anti-spamic or carminative properties. It will therefore bring relief to stomach upset such as gas or bloating. Menstrual cramps: It works as anti-spasmodic to relax the contracted smooth muscles and give relief from the painful menstruation. Sexual activity: Due to its aphrodisiac properties, it has been used for years to arouse sexual desire and enhance sexual activity. It enhances blood flow to the pelvic region, which further leads to increased performance in bed. It can be taken in the form of powdered extract that is available in capsules and pills. Or, it can be consumed directly by mixing it in food or beverages. If you are taking in the form of capsules, 250 mg two to three times in a day is sufficient for effective results. It also comes in the form of oil which can be used to stimulate hair growth and get relief from joint pain. The delicious, pungent flavor and aroma as well as potential health benefits of this herb can be enjoyed by adding it to familiar foods. Chinese doctors prescribe ginger tea with brown sugar to ease menstrual pain. Ginger tea and ale helps in relieving indigestion. Fresh grounded ginger can be used in making ginger tea, which eases the congestion and pain associated with cold and cough. You can also prepare a herbal drink by adding root slices of this herb to the hot water. Add lemon or orange juice and one spoon of honey. This herbal drink is very effective in treating headaches, easing colds and soothing sore throats. Gall stone patients should avoid taking this herb as it stimulates the release of bile from the gall bladder. Avoid taking it in large quantities as it may increase the risk of bleeding. Could a little color change your life?